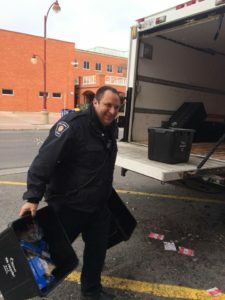 December 9th was the Annual City of Ottawa Firefighter’s Food Drive. The Firefighters were picking up food donations at local grocery stores and delivering to the Orléans-Cumberland Community Resource Centre (OCCRC) Food bank. Orléans residents were extremely generous. It was an all-day event with lots of kind volunteers from OCCRC and the Kiwanis Club of Orleans helping unpack and sort donations.